New Amsterdam Apple Pie - Kosher In The Kitch! New Amsterdam Apple Pie - Kosher In The Kitch! When I first moved to the United States with my family, we settled in Stamford, Connecticut. My mother insisted we buy that particular house because of the massive apple tree in the back yard, complete with a swing tied onto a low branch. At the time, apples in Thailand (my native country) typically sold for close to $50 a pound, as they were considered “exotic” fruits. Naturally, my mother’s excitement over the prospect of unlimited apples in her own back yard got the best of her. Consequently, I learned how to make apple pie. Lots and lots of apple pie. This pie worked out perfectly fine for me, until one day my fiancé requested one. It was then that the curve ball came. “I like it with crumbs on top,” he said. My eyebrow raised as my eyes widened. Crumbs on top? What matter of silliness is this? Then I thought, the guy gave me this huge diamond ring, the least I can do is give him a crumby pie. 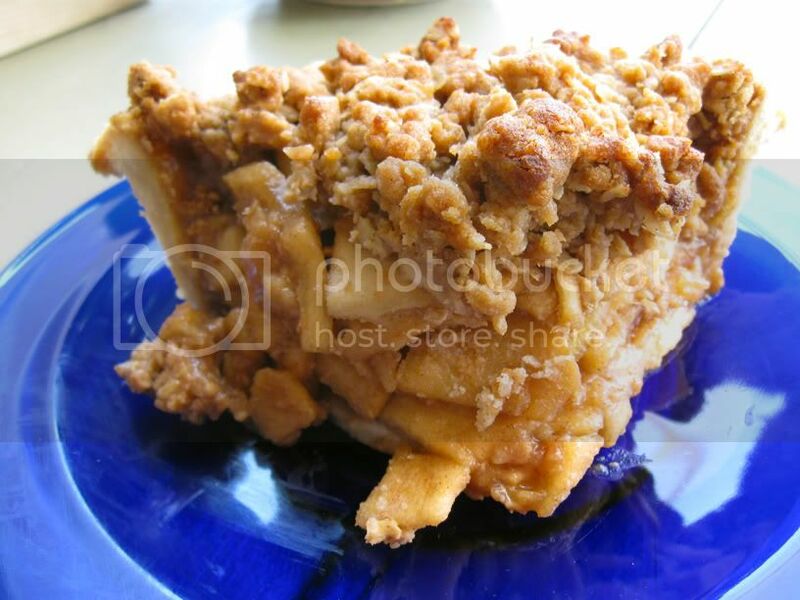 So I set to work, revamping my cherished apple filling to compliment and withstand a Dutch crumb topping. This is what I came up with, and I must say, Eric might be onto something with these silly crumbs. Any way you slice it, it’s a great way to end a meal, not to mention a perfect way to start out the new year. L’shanah tova! Preheat oven to 400F. Roll out dough to fit into a standard 9 1/2″ pie pan. Place pie crust into freezer. If you are not using an all-butter dough, brush the bottom of the pie crust with a beaten egg white before baking. While crust is in the freezer, combine sliced apples, brown sugar, salt and cinnamon. Taste frequently to make sure you have the seasonings right. This variation depends on how naturally sweet, spicy or juicy the apples naturally are. After well seasoned, add lemon juice, sprinkle corn starch over the apples and combine. If the apples are particularly juicy, you may need to add an extra teaspoon of corn starch. Remove the pie crust from the freezer. The crust should be very cold, but not frozen. Pour apples into the pie crust and spread evenly. Place pie into preheated oven and bake for about 10 minutes, to dehydrate the apples. While pie is in the oven, make streusel topping by combining the dry ingredients and incorporating the butter with your fingers or a pastry cutter. Alternatively, you may use a food processor. Process/work the ingredients until you get crumbs. Remove pie from the oven and reduce the heat to 375F. Spread crumb topping evenly over the apples and return to oven. Bake for 30 to 35 minutes more. Pie is done when filling is bubbling and slightly thickened. It will probably smell pretty good too. Allow pie to cool a bit and serve. If you can’t wait that long, ice cream helps a lot. Enjoy! wow, this look great! Easy too! Yumm!